Amanda Jouppi Photography: A day at the fair. We went to the fair today. As she did last year, M really enjoyed riding on the 'car' ride! The bar could not have been in a worse spot as far as taking pictures of E, but these were too funny to not share! 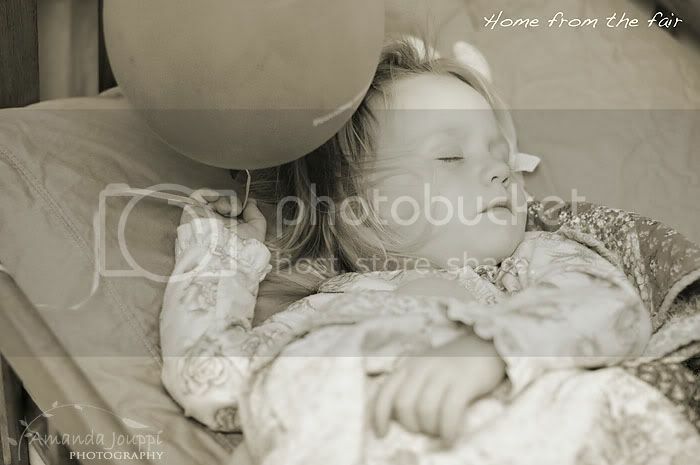 When my husband checked on her tonight he found her like this; hanging on to her helium balloon!! I moved the ballon for safety reasons but had to get a picture (or a few) first! Lovely expression of joy/excitement on the tryptic composition. OMG the expressions are just too cute. She is having so much fun. I bet she's dreaming about balloons at the fair. I could be wrong, but I think M might have enjoyed the fair! lol. Great shots! The balloon photo is priceless! Those are just delightful! The balloon pic is so beautiful it almost chokes me up.